Halloween is a great time to get creative. Many of us enjoy decorating our home, making crafts and baking all sorts of Halloween treat like yummy frosted cut out sugar cookies. 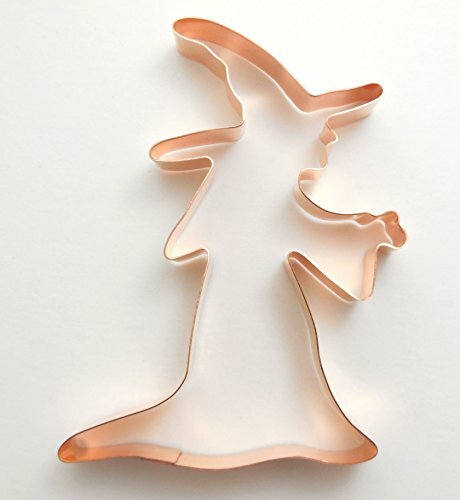 And to make cut outs for your next Halloween gathering you want to use some fun Halloween themed cookie cutters. 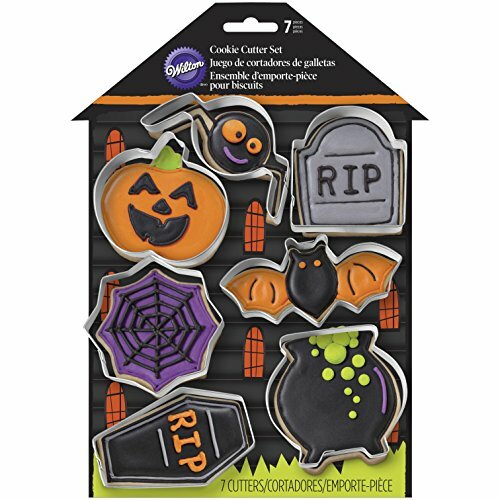 These Halloween cookie cutter sets are not only great for making cookies, they can also act as a template for your craft projects. 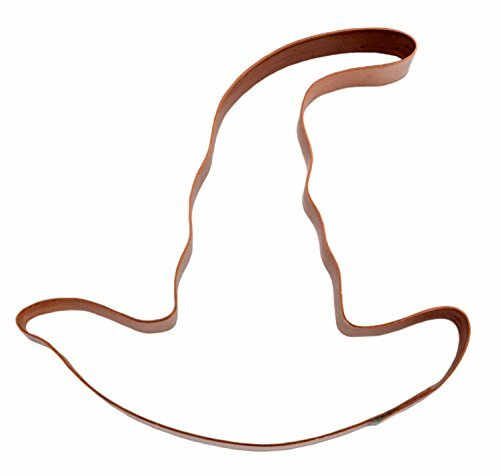 Below are some popular Halloween cookie cutter sets according to Amazon consumers. 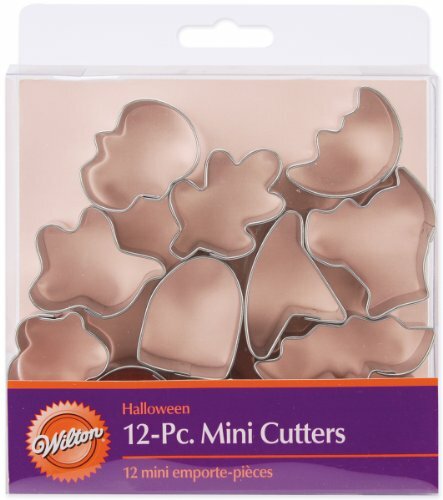 This 18 piece Halloween cookie cutter set from Wilton comes in a tub for easy storage. You get all kinds of cute shapes including a pumpkin, vampire teeth, a skull, a cat, a ghost, a witches hat and more. 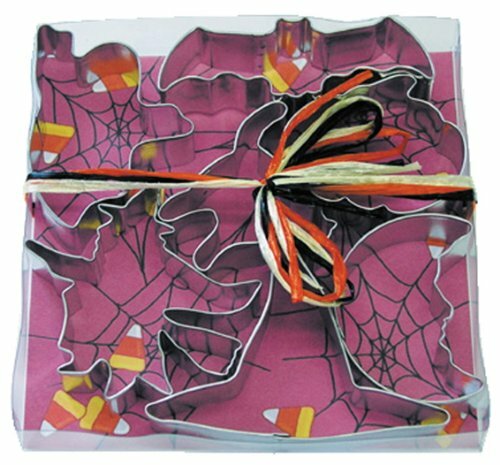 There are also some autumn themed cookie cutters such as a maple leaf and an apple. 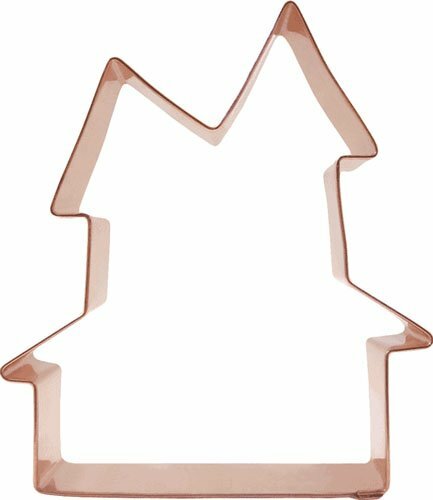 The cookie cutters measure approximately 3 1/2 – 4 inches and are dishwasher safe as well. 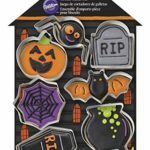 If you are looking for a smaller set then this Wilton 7 piece Halloween cookie cutter set features everything you need for delicious Halloween cut out cookies. The set features the following spooky characters: a tombstone, a bat, a witch, a pumpkin,a cauldron, a spider, a spider web, and a coffin. Most of these cookie cutters measure approximately 3 inches. 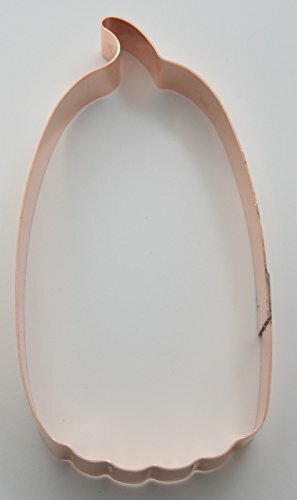 The bat and coffin measure approximately 3 1/2 inches. 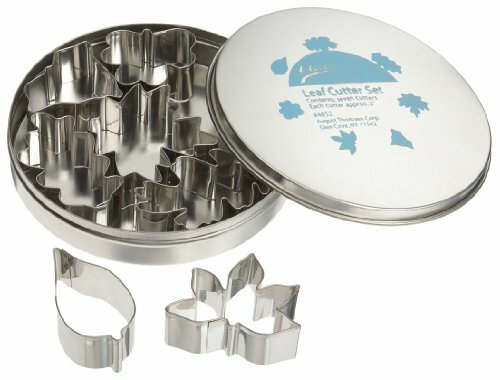 If you are looking for more of a harvest theme cookie cutter for Halloween time then the Ateco 7 Piece Stainless Steel Leaf Cutter Set is a really popular choice. These cookie cutters are professional quality, made of stainless steel. Each cookie cutter is approximately 2 inches in size. Convenient storage tin is included. Tip: Even stainless steel can rust if not stored properly so be sure these are dried thoroughly before storing. 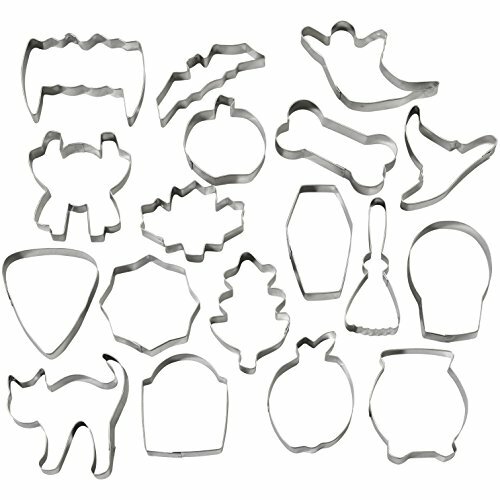 The R & M Halloween 7 Piece Cookie Cutter Set are really cute and offer a variety of shapes. The set includes a witch on a broom, a witches hat, a cat, a ghost, a pumpkin, a bat and the moon. These cookie cutters are also great for crafts. Hand washing is recommended. These come in a gift box and would make a great gift for the Halloween enthusiast. 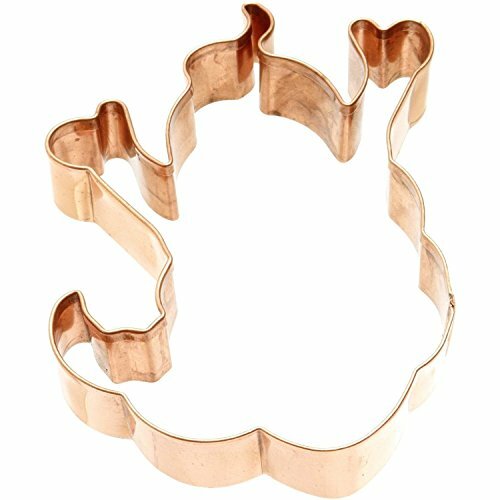 For the ultimate cookie cutter collection that covers not just Halloween but all major holidays, the Wilton 101 Cookie Cutters set is a great choice. You get a wide variety of cookie cutters that all conveniently store in a large tub. These are also great for crafts, making cute sandwich shapes and more. 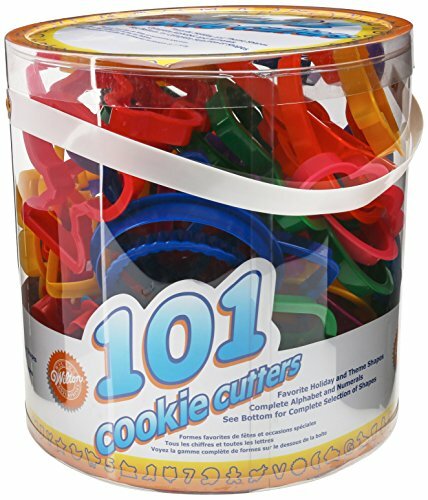 You get 101 plastic cookie cutters with an average size of 3-1/2 x 3-1/2 inches. Dishwasher safe. The Wilton Mini Halloween Cookie Cutters measure approximately 1 1/2 inches and are a great size if you want to make plenty of cookies. You get a skull, a witch’s hat, a bat, an acorn, a ghost, a house, a maple leaf, a moon, an oak leaf, a tombstone and a cat. These are really cute. You can get really creative with these over Halloween such as using them to cut cheese into little shapes, for mini sandwiches and more. Great for party food. 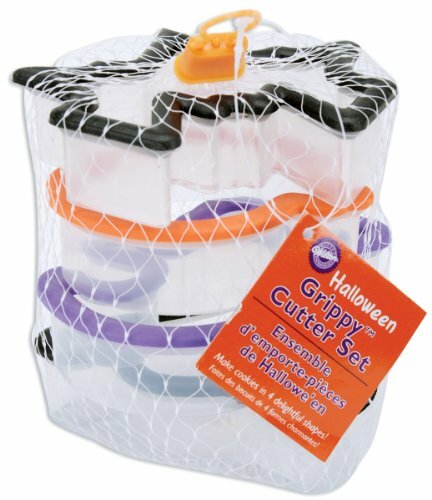 The Wilton 4 Piece Grippy Halloween Cookie Cutter Set offers a comfortable and safe grip. 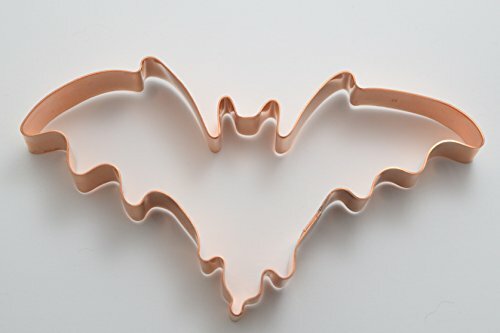 Cookie cutters measure 3-1/2 x 3-1/2 inches and feature a bat, a ghost, a cat and a pumpkin. 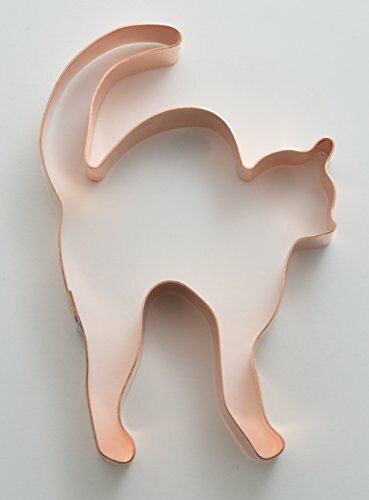 These cookie cutters are also a nice size for those who want to make a larger cookie. These are a nice alternative to metal cutters and cut cookies with ease. They can also be used for other foods like cutting sandwiches into fun shapes. 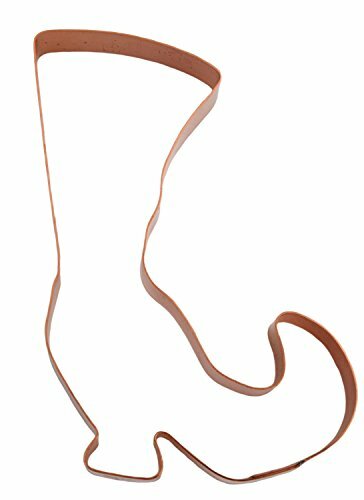 If you are looking for large Halloween cookie cutters then these copper Halloween cookie cutters are both functional and decorative. For example, you could group them together on the wall as “kitchen art” and swap out different cookie cutters depending on the holiday. 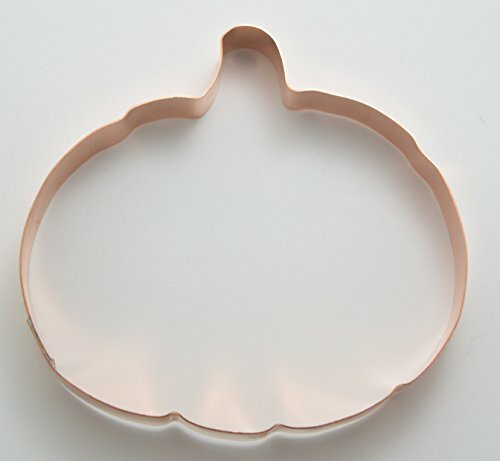 Many love to collect copper cookie cutters and give as these as gifts as well. Halloween is such a fun time to get creative and cookie cutters are a must for creating delicious cookies and other recipes that can be enjoyed by friends and family. This entry was posted in Kitchen and tagged Copper Halloween Cookie Cutters, Halloween cookie cutter set, Halloween cookie cutter sets, Halloween cookie cutters, Large Halloween Cookie Cutters, mini Halloween cookie cutters on August 17, 2016 by Halloween Inspired.